Weis Shoppers! $1 Gerber Graduates Grabbers! Woot! Here is an awesome deal you can score at Weis Markets. Gerber Grabbers Pouches are on sale for $1.25. 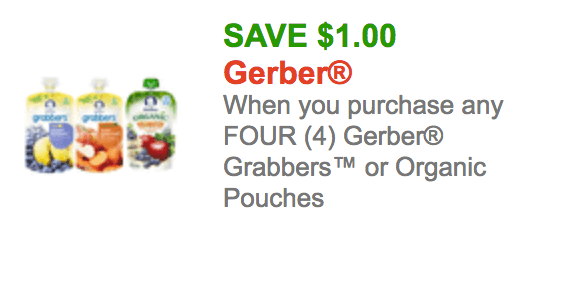 We have this great $1/4 Gerber Grabbers or Organic Pouches, exp. Varies available to print making these just $1.00 each when you buy 4! Yoplait Custard Yogurt Only $0.64 at Kroger! Healthcare Instant Savings – Great Deals on Aleve and Advil at Stop & Shop, Giant, and Martin!